I like having water in my eyes when I swim... said no one EVER! 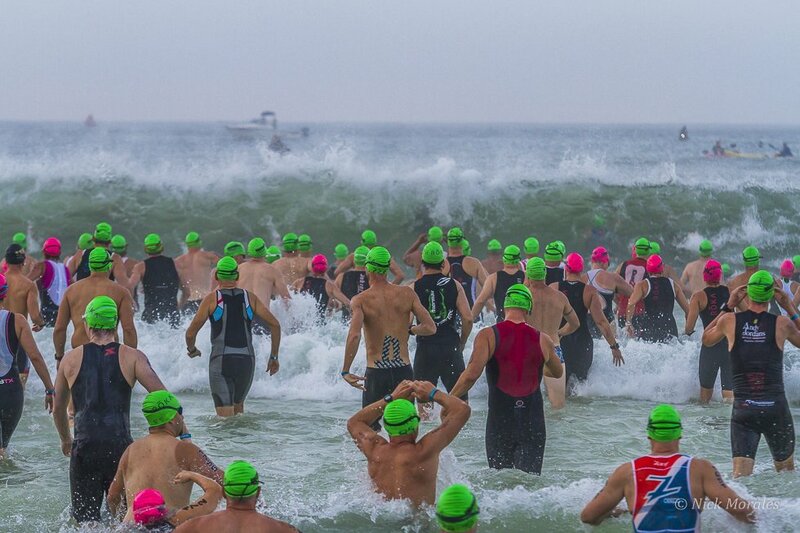 As if the swim part of a triathlon weren't tough enough. You've already got hundreds if not thousands of flailing arms and legs pummeling you. You've already got dim early morning light. You've already got water splashing every which way. You've already got doubt in your head about which buoy is first and which way to turn. You've already got anxiety about not being able to see the rocky bottom below you. Can you deal with all of this AND have uncomfortable, leaky, foggy goggles? If just one thing can go right for the swim, please let it be that my goggles fit properly and allow me to see the hell I'm going through clearly. I've tried just about every style and brand of goggle over the last 30 years. Mask-style goggles in a variety of sizes, some that made me look like a sponge diver in Tarpon Springs, in the eye-socket racing goggles, mirrored, tinted, high contrast, clear, you name it. I've settled on framed goggles, sometimes known as open water goggles. These fit around the eye socket (not in it) and seal with a soft silicone rubber. This makes them much more comfortable than racing goggles that contact inside the eye socket. You may be in the water for over an hour with many hours of racing after you get out so let's make these things as comfortable as possible, shall we? Swimming straight lines in open water is tough. I like goggles with flat lenses that minimize distortion. My brain does a really good job of distorting what I'm looking at all by itself. It doesn't need any external help. There's room for debate about clear or tinted lenses. It depends a little on the course and time of day. But I've found that clear lenses are the best in the majority of situations. About the only time clear lenses fall short is when you are sighting directly into a rising sun. But even then, tinted lenses may put less strain on your eyes, but you still may not be able to sight your target because they're so dark. I think you'll find that clear lenses provide the best all-around performance and visibility. How about TWO sets of goggles? That's better than one, right? The one thing that is common to all goggles is that they are easily lost. They fall out of gear bags on the deck or at the beach as if they just didn't want to leave. Like the goggles take it upon themselves to jump to freedom. They get left by absent minded triathletes in transition, hanging on the bike or laying on your shoes. There is some supernatural force at work to part swimmers from their goggles all the time. That's why you are getting TWO sets of goggles with your subscription this month. Blueseventy's Vision goggle is perfect for all competitive and training environments and will withstand salt, fresh and pool water abuse. It offers wide peripheral vision from a super soft silicone eye gasket, utilizes a simple button adjustment system and an extremely durable strap. The Vision goggle is a top choice for many open water and triathlon competitors. 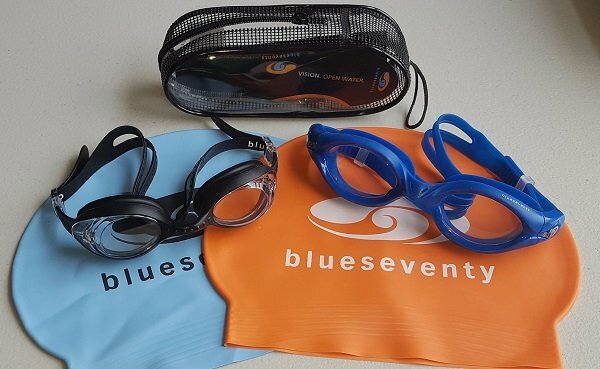 Blueseventy's Element goggle is slightly smaller than the Vision goggle but has clear side-lenses that let in additional light. The Element combines the features that make Blueseventy's open water goggles so comfortable with the low-drag socket feel of competitive in-the-eye-socket goggles. It's the best of both worlds. A high quality soft silicone gasket is attached to a traditional flat lens to make the Element a durable goggle that will hold up over many races and hours of practice use. It's TWO pairs FREE! YEAH! Triathlon season is in full swim now so I know you are going to get a lot of use out of these two pairs of goggle! Save one as a backup or use one for training and the other for racing. However you do it, fuel up and do it!